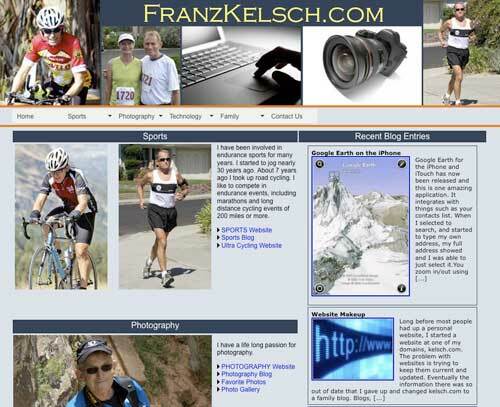 Long before most people had up a personal website, I started a website at one of my domains, kelsch.com. The problem with websites is trying to keep them current and updated. 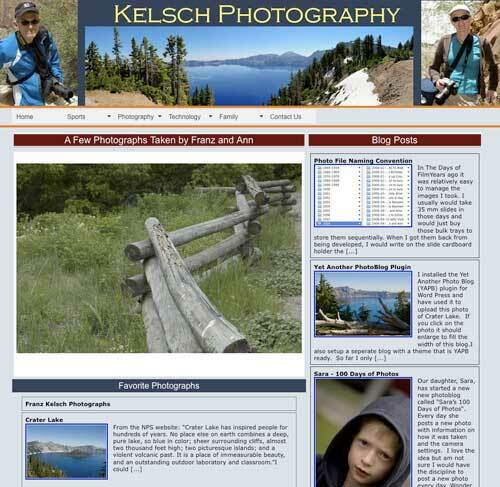 Eventually the information there was so out of date that I gave up and changed kelsch.com to a family blog. Blogs, such as this one are much easier to keep up and post new information. I have setup several blogs for different purposes, as have most all of my children. Flash based slide show that goes through about several images. RSS feeds from the various blogs and photo galleries. So with these feeds the website keeps current without any need for me to do anything. I can change the images for the slide shows at any time by using Lightroom, selecting 30 images, and doing an export to the right folder, then FTPing them to the site. It only takes a minute. See the screen shots below. Click on any of them and visit that website. Here is a screen shot of what Kelsch.ORG looks like now [Visit Site]. 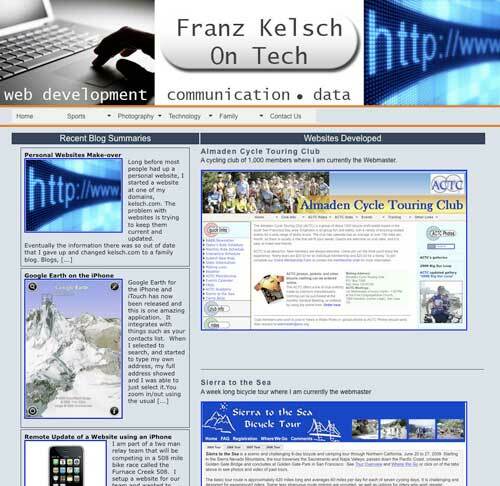 Here is a screen shot of what the FranzKelsch.com site looks like now [Visit Site]. 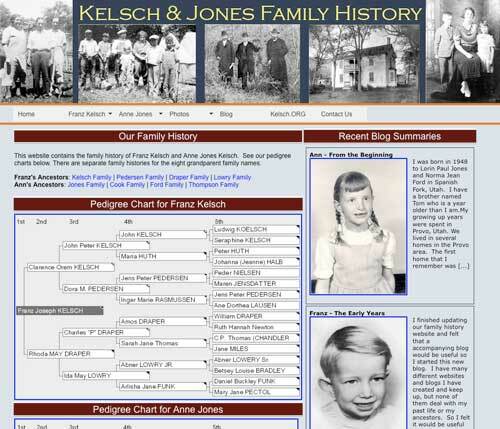 Here is a screen shot of what KelschFamily.NET looks like now [Visit Site]. Here is a screen shot of what my Photography site looks like now [Visit Site]. Here is a screen shot of what my Tech site looks like now [Visit Site]. See my detailed tech blog entry for additional information. I am creating this blog using Adobe Contribute 3, which was included in the Adobe Creative Suite 3 Wed Premium edition that I recently installed. It allows me to create blog entries off line, then upload them to the server. Previously the entries were all made through a WordPress provided webpage on my server. Cotribute 3 can also be used to edit webpages directly, but I will most likely continue to use Dreamweaver for that since I prefer to keep the original on my local computer and publish to the website. Here is what the screen looks like as I am creating this blog. I am glad I bought the 8 Gb version of the iPhone since I have nearly filled up that space now. The video includes two movies and several video podcasts. The audio includes my 4 and 5 star rated music and many audio only podcasts. The photos include all my photos I have in iPhoto for 2007. I am sure they will have a 16 Gb version of the iPhone soon since they are now offering that in the new iPod Touch. I don’t think I need a hard disk based iPhone like some want with 80 Gb. That would defeat the function of being slim enough and long enough battery to use as a phone. Another limitation that I am finding is Apple’s approach of not allowing the installation of programs by 3rd party developers, except what they can do with Safari. I just think there would be a lot of neat little programs like were developed for Windows Mobile, that would be useful. On the top of my list would be a real version of Skype and a version of Slingbox player. They have a version of the Slingbox player for Windows mobile, Windows smart phones and Palm phones. But all of those allow the installation of a program. Currently with the iPhone the only thing a developer can do is host something on a website you browse to with Safari. Considering that Apple claims the iPhone is running OSX, it should not be difficult for them to open it up. Their claim about security is most likely a cover for what they really want, and that is to control everything, typical of Apple. The final limitation is the use of the AT&T Edge network. When I am at home it uses WiFi which is fast. But Edge is slow. But I had that on my old Windows Smartphone so I guess I am not sure what I am missing. Even with those limitations, the iPhone is by far the best phone I have ever purchased and I continue to be amazed by is capabilities. The user interface is outstanding. Hre is an update to the post about buying a new iPhone, after I have had a chance to use it for a few days. On Saturday, I broke down and finally bought a new iPhone. After Apple reduced the price of the 8Gb model by $200, it seemed like a good deal. My existing phone with AT&T cost me $20 a month for the data plan (with no text messaging) and the new iPhone data plan is the same cost, so on a monthly basis there was no increase in costs, plus I get 200 text messages included. There is just no comparision between my old Windows Mobile phone and the new iPhone. I can actually use the iPhone for email and web browsing while that old phone was almost worthless for that. I actually don’t use my phone as much for voice calls as for data, so it made a lot of sense to go with the iPhone. I have now had a chance to use the phone for a few days and clearly state that this is by far the best phone I have ever used, even exceeding the Blackberry phone that I had while I was working. I would even go as far as to say it is the best user interface on any device I have ever used. My previous phone was a Cingular 3125. It had Microsoft Mobile 5.0 on it but had a regular cell phone keypad. It was very hard to read email messages on it and for me to send a message meant only a few words. I did like the slim design. However it got poor reception. When I complained about that initially, the Cingular store said it was just our local town and since I was new to Cingular, I was not sure. But with the iPhone, now on the same network, gets 4 bars of reception in the exact same place my old phone barely could get one. The iPhone is the first phone I have ever seen that browsing the web is at all practical. Sure it is not as useful as a regular computer, but you can’t put a computer in your pocket either. The fact that it uses WiFi is a big plus since the Edgne network can be slow (as I already knew from my old Windows Mobile phone). It would have been nice to have the iPhone use the new 3G network, but for me I rarely would be in a place to take advantage of that at this point in time. There are tons of reports on the workings of the iPhone so I will stop here and just say I am very pleased with the phone. I just need to learn to type on the touch sensitive screen that has no tactile feedback. I am improving but have some ways to go. Apple has once again taking a mature market and turned it upside down.